The Focus on French Films festival, now in its 11th year, came again to Greenwich last weekend, captivating us with the ambiance of foreign language films and giving us an appreciation for the creative people who make them. Renee Amory Ketcham, who chaired the festival, reported the same number of attendees this year as last despite the fact fewer films were shown: "4,500 cinephiles from the tri-state area." 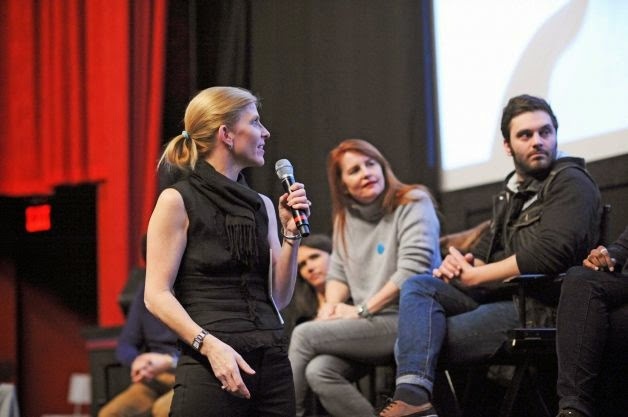 The 20 films with newly added shorts selections were thoughtfully vetted, said Anne Kern, of Riverside, an associate professor of cinema at Suny Purchase, who was involved in choosing the films. "The French produce 200 films a year," she said. "What we are doing for our festival audience is curating these French films and winnowing them down to choose what pleases and delights our audience." A survey of last year's festival viewers showed more than a third had attended the festival for five years or more, indicating they approved the choices. First on my list to see was the premiere of the documentary "The Pursuit of Endurance -- On the Shoulders of Shackleton," an inspiration realized by Luc Hardy, our hometown explorer, entrepreneur and venture capitalist. Since learning of that great survival tale of explorer Sir Ernest Shackleton's 1914 Antarctica expedition aboard the ill-fated ship "Endurance," Hardy determined to trace Shackleton's footsteps. It took him two years to build his team, first enlisting David Hemplemann-Adams, the British first-climber of all seven of the world's highest summits, plus five other men and two women. A sailboat was found, as was a captain able to traverse such a course and cameramen brave enough to capture it all. Of the courageous females, one was a scientist and another an extreme-sport snowboarder who dazzled viewers as she risked all shooting straight down snow-encrusted mountainsides. The gorgeous shots of the expedition, showing the explorers' group stretched across vast snowscapes, were accomplished in part with drones, a technology embraced by Hardy. The drones afforded unforgettable images of the masses of seals, penguins and elephant seals on South Georgia Island. 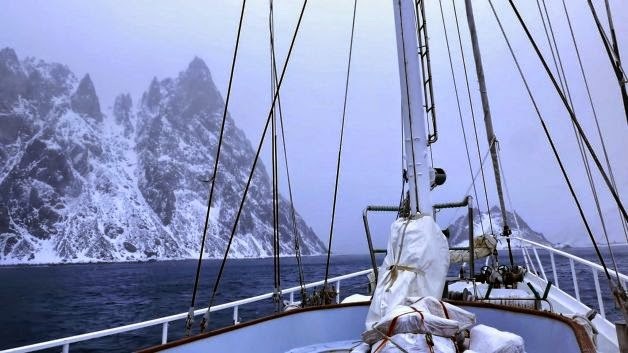 But having the most impact was the sudden and formidable sight of Elephant Island rising out of the ocean in all its dark and fearful grandeur, a jagged mountain of rock, snow and ice where Shackleton's crew managed to survive for five months eating penguins and seals while waiting for rescue. Other festival film highlights included the slow-moving but architecturally ravishing film "La Sapienza," focused on a Swiss architect in love with the 7th century works of Italian architect Borromini. The story was told in both French and Italian. Over 100 showed up for that one, including U.S. Rep. Jim Himes, D-Conn., and wife, Mary. A film set amid the lushness of the Angkor Wat Temple in Cambodia called "The Gate" -- its French title was "Le Temps Des Aveux" -- told the stark story of a French ethnologist captured by the Khmer Rouge. But the real standout for many was the film "Once in a Lifetime," or "Les Heritiers," the true story of a charismatic teacher in a Parisian suburban high school who involved her disparate class in an essay contest and, for inspiration, invited a Holocaust survivor to address them. The result was a transformative experience for the class. Anne Kern, post screening, introduced the film's director, Marie-Castille Mention-Schaar, a former American journalist and now-naturalized French citizen and director who had received the screenplay from one of those transformed students. Mention-Schaar spoke of following the teacher with a camera for a year, then added a footnote. When the Buchenwald concentration camp survivor told the class the date of the camp's liberation in 1945, he mistook the date as Jan. 29. The survivor, said Mention-Schaar, had died this year -- on Jan. 29. It's the sharing of stories like this that make a film festival with the creators intriguing. Missing in the Bow Tie cinema lobby this year were the few small tables where film-goers and -makers could converse. The sit-down area was available when the festival was at SUNY Purchase, said Kern. She said she believes in the value of viewers able "to share their love and their opinions of films." "This is the reason for a festival," she said, "It really creates a cultural event." Also viewing these films are the thousands of students in the tri-state area that come to the festival, some 6,000 students in 10 years, Kern said. One hopes a good number of them saw the film "Once in a Lifetime." Sitting in front of me for "The Gate" was Roger Lurie, whose wife, Claude, is French. He finds French films to have more depth than American films, he said. Time did not allow catching one of the 10 comedies in the mix this year, including, "I Kissed a Girl." Kern described it as "about a gay man going straight." "People were crying with laughter," she said. Kern said she couldn't imagine such a film being made in America, "But the film portrays a vision of the world where homosexuality is no longer a special category. "French films afford an expanded vision of what cinema can be," said Kern, talking about the support artistic cinema gets from the French government. Every movie ticket sold in France she said, has a portion held back for first-time film directors.